I just received word this weekend that Firedancer has made the short list for the EPIC eBook Award in the Fantasy category.The Electronic Publishing Industry Coalition is dedicated to advancing e-books as a valid alternative to print. Although Firedancer is available in both print and electronic forms, it was eligible and nominated several months ago. Now it is a finalist for what is arguably the most prestigious award for electronic publishing. Finalists are picked by jury from thousands of nominated works, so to be included on the list is an honor. I also have the honor of having a nominated story. My short story "Wolf Dreams" is in Wolfsongs 2, a finalist in the anthology category. So, a double whammy! I won't find out until March who wins, but for now, just being a finalist feels great. I'd like to offer my congratulations to all the other finalists as well. 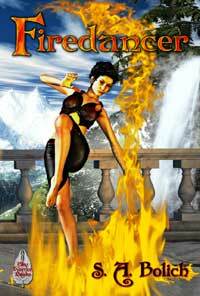 You can find Firedancer and its sequel, Windrider, at all major book outlets, or go to my website and click through directly. If you've ever wondered what life would be like on a planet where wind, fire, and water are all living, thinking entities with their own agendas, these are the books for you. Seaborn will be out next year to round out the trilogy.